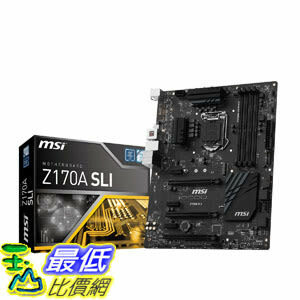 [美國直購] MSI 主機板 Pro Solution Intel Z170A LGA 1151 DDR4 USB 3.1 ATX Motherboard (Z170A SLI) PS.圖片僅供參考,商品以實物為准! 6,210[105美國直購] MSI 主板 Pro Solution Intel Z170A LGA 1151 DDR4 USB 3.1 ATX Motherboard (Z170A SLI Plus) B019EYYNP0PS.圖片僅供參考,商品以實物為准! 6,822[美國直購] MSI 主機板 Pro Solution Intel Z170A LGA 1151 DDR4 USB 3.1 ATX Motherboard (Z170A SLI)PS.圖片僅供參考,商品以實物為准! 7,558[美國直購] MSI 主機板 Pro Solution Intel Z170A LGA 1151 DDR4 USB 3.1 ATX Motherboard (Z170A SLI Plus)PS.圖片僅供參考,商品以實物為准! 7,576[105美國直購] MSI Pro 主板 Solution Intel Z170A LGA 1151 DDR4 USB 3.1 ATX Motherboard (Z170A SLI Plus) B019EYYNP0PS.圖片僅供參考,商品以實物為准! 8,504[美國直購] MSI 主機板 Enthuastic Gaming Intel Z170A LGA 1151 DDR4 USB 3.1 ATX Motherboard (Z170A Gaming M3)PS.圖片僅供參考,商品以實物為准! 11,100[美國直購] MSI 主機板 Enthuastic Gaming Intel Z170A LGA 1151 DDR4 USB 3.1 ATX Motherboard (Z170A Gaming M7)PS.圖片僅供參考,商品以實物為准! 14,804[美國直購] MSI 主機板 Enthuastic Gaming Intel Z170A LGA 1151 DDR4 USB 3.1 ATX MotherboardPS.圖片僅供參考,商品以實物為准!